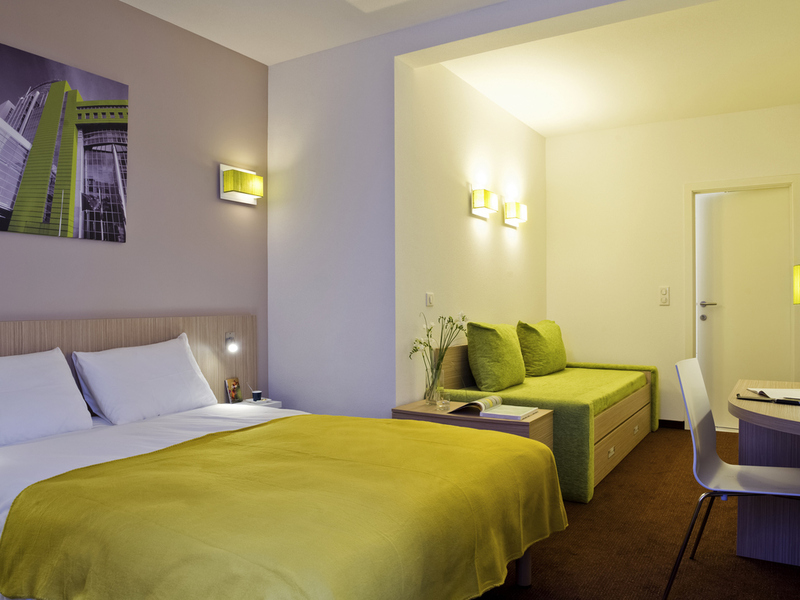 Are you are looking for somewhere in Brussels with all the comforts of home? Feel right at home in our modern apartments, which are fully equipped with a kitchen, TV and free WIFI. Public transport links are easily accessible. Brussels Park is very close to the Adagio Access Brussels Europe hotel and is perfect for relaxing strolls. Also in the area: the BELvue museum, the Museum of Original Figurines, the Royal Palace of Brussels and the royal museums walking distance of the hotel. While you're here, visit the Grand Place, the Mont des Arts, the Grote Zavel, Sint-Katelijneplein and Cinquantenaire Park. Needless to say, your stay in Brussels is not complete without saying hello to Manneken Pis. You will feel at home in one of our 110 studios for 2 or 4 people. All rooms are fully equipped with kitchen, TV, air conditioning, bathroom with bathtub or shower, free Wi-Fi and office space. I like the location and the people on the reception. It would help to vacuum public areas, including elevators, more often. For security purposes, one should need to use an e-key (room key) to get the elevators to work. Everything was fine, except people sitting and chatting until late on the table in the small court at the hotel entrance. The hotel was easy to find, had very friendly and helpful staff, was very comfortable and clean - all you would hope for. This hotel was exactly what I needed for a one-night stay on a business trip. Quick check-in and check-out, comfortable bed and decent breakfast. Of course being really close to my meeting makes it even better! I would stay here again without question. exceeded expectations. location very handy to people who love to walk and also quiet. Room totally adequate and staff at guest excellent, as was breakfast. Exactly what I needed for a one-night stay. Dear J., We thank you for giving us your feedback about your last stay at Adagio Access Brussels Europe. We are happy that you had a great stay with us, we will not hesitate to share this review with our staff which really do their best for all our guests. We remain at your disposal for any further request or question and hope to welcome you back soon. I am very satisfied by the hotel and most especially by the whole team. The only negative is the TV which needs to be replaced and the SFR tv package which on occasions has failed. I accept the later is outside the direct control of the hotel. Dear Kat, We thank you for giving us your feedback about your last stay at Adagio Access Brussels Europe. We are happy that you had a great stay with us, we will not hesitate to share this review with our staff which really do their best for all our guests. We remain at your disposal for any further request or question and hope to welcome you back soon. Surprised that the room would not automatically be cleaned every night. Was OK for me, only staying 2 nights; but would have resented having to pay extra for more frequent service. Price was quite high; but maybe all central Brussels properties are similarly priced. The stay is good. But the cleaning schedule is too bad. It's only once for 14days which is bad and I've stayed in a good hotel before which does cleaning daily. The front office executives are really helpful. But hotel infra is too bad. Great facilities, room was clean. I liked the team and everything was fine. Rooms are clean, service always available and friendly, central location, no noise from neighbours. Super good. Excellent location in the heart of the European quarter, excellent service and competitive price. I arrived very late at night and the staff was very welcoming. I checked in fast and my room was quiet, ideally situated in the 6th floor so I could open the window ajar during the night. Clean bedroom and bathroom, convenient facilities (fridge and kitchenette). Breakfast with a lot of choices. It was my 2nd stay in this hotel and I certainly will come back next time my work sends me to Brussels.